Keep your favorite trees protected from wildlife in a bold new way with the Gardman Green Premium Tube Trellises. This set of 8 half round trellises brings a wealth of options to your garden, from supporting climbing vines to protecting trees to covering a light post. The steel core of each creates a durable trellis, and the green, plastic coated finish meshes with your plants. Eyehooks at the corner of each unit allow you to easily connect them together with hardware to create an 8" diameter tube, or stack one atop another for a fantastic, vertical adornment. The 8 individual tubes each reach 36" high, and their rectangular openings add both strength and style to them. Ensure your garden has versatile and lasting support by adding these Green Premium Tube Trellises to it. 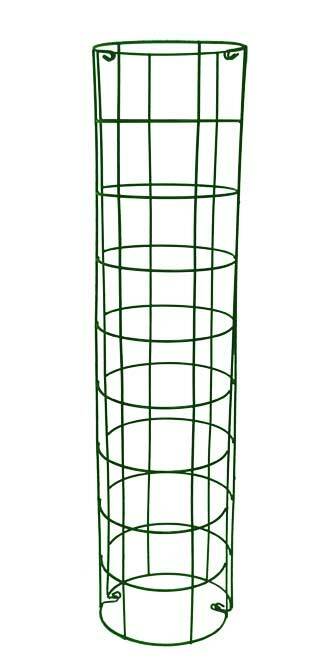 Note: This case pack includes 4 of the Gardman Premium Tube Trellises, Green, 36"H.